The journal provides an opportunity to publish articles of greater depth and length than is possible in the proceedings of various existing conferences, while addressing an audience of researchers in computer security who can be assumed to have a more specialized background than the readership of other archival publications. 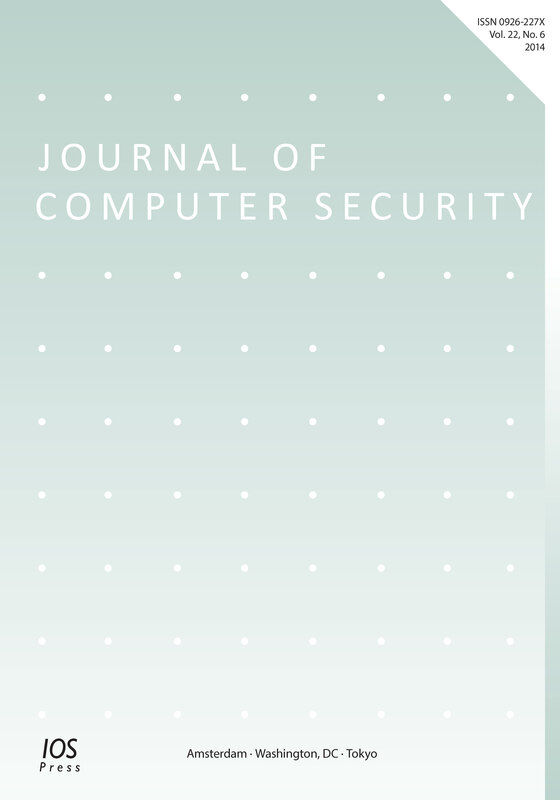 The journal welcomes contributions on all aspects of computer security: confidentiality, integrity, and assurance of service - that is, protection against unauthorized disclosure or modification of sensitive information, or denial of service. Of interest is a precise understanding of security policies through modelling, as well as the design and analysis of mechanisms for enforcing them, and the architectural principles of software and hardware systems implementing them. Authors are requested to submit their manuscript electronically to the journal’s editorial management system in the form of a PDF file. Authors are encouraged to use the JCS LaTeX style file to follow the formatting rules explained in more detail below. Submitted manuscripts must represent original material, and no version of the submission can be simultaneously submitted to any conference, journal, or any other publication. The journal encourages submissions which have not been previously published. JCS also publishes papers that are significant extensions of outstanding papers published elsewhere (see Prior Publication Policy). The journal discourages the submission of excessively long papers (longer than 45 pages in JCS format, including figures and references, but excluding appendices), and unnecessary digressions even in shorter papers. The restrictions is to motivate authors to bring out the essence of their papers more clearly, to make it easier for the reviewers and readers. Typical expected length is around 30 pages. Material above 45 pages should be included as an appendix. Submitted papers are evaluated by anonymous referees for originality, relevance, and presentation. All accepted papers receive at least three reviews. The journal is committed to provide an editorial decision within 3 months of submission. The reviewing process may take longer for unusually long submissions. Manuscripts must be written in English. Authors whose native language is not English are advised to seek the advice of a native English speaker, before submitting their manuscripts. Peerwith offers a language and copyediting service to all scientists who want to publish their manuscript in scientific peer-reviewed periodicals and books. Submitted manuscripts must be formatted to print on either A4 or US Letter sized paper. Regardless of the size of the paper, the text block must fit within a centered rectangle 15.1cm wide and 19.5cm tall. All content, including figures, tables, and footnotes, must fit within this text block. Text should be printed in a single column using at least an 11 point Roman font on at least 12.375 point leading. We have made available an IOS LaTeX style file that will format text according to these requirements. Every page of the manuscript should be numbered. No reference should be made in the text to page numbers. Symbols and labels used in plots and figures should be easily readable and interpretable when printed; they should not rely on on-screen magnification to be intelligible. Please also avoid the excessive use of italics and bold face. Submissions that are extensions of one or more papers (by one or more of the authors) previously appeared elsewhere must have a major value-added extension over what appeared previously. In particular, a submission based on previous publications should have at least 25% new material. This new material should be significant new content: it cannot be simply some rewriting, trivial proofs, or performance figures that offer no new insight. Previous publications should be explicitly referenced in the submission and the added value over them explicitly discussed in the manuscript. - Previous papers of which the manuscript being submitted is an extension. Such PDF file should then be uploaded on mstracker.